Arthur Jarvis University 2018/2019 Post UTME/DE Admission Form is Out Online. Arthur Jarvis University Post UTME Form 2018… In this article you will be given detail information about Arthur Jarvis University Post UTME Screening Form, Screening Requirements, How to Apply for Arthur Jarvis University Post UTME Screening Form, Application Deadline and other necessary updates for free. 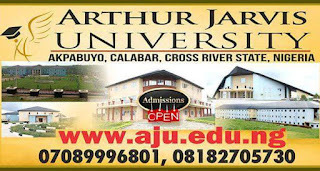 The management of the Arthur Jarvis University (AJU), Akpabuyo, Calabar, Cross Rivers State, invites applications from suitably qualified candidates for admission into its undergraduate programmes for the 2018/2019 academic session. Affordable tuition including accommodation fee per annum. (Installment semester payment applicable). The environment is serene and most conducive for learning. World class educational facilities including ICT/Library/Study skills centre/Entrepreneurship centre/Career Counseling. World class hostels and housing facilities. World class sports/ recreational facilities/Food courts/entertainment centre. World Class University Hospital & Wellness Centre. World class faculties and lecturers with international exposure and experience. Globalised knowledge based curriculum and globally recognised degree. Finish your studies in record time. No strike. Peaceful environment of CALABAR. There are opportunities of getting local/foreign scholarships in Arthur Jarvis University. Possess the academic qualifications as specified by the Joint Admissions and Matriculations Board for course of choice. Achieve at least the approved minimum pass mark in the Unified Tertiary Matriculation Examinations for year of entry. Candidate who sat for the UTME who did not indicate Arthur Jarvis University in any of their choices are eligible to apply. There is Direct Entry Admission for A levels holders for Degree Programmes in 3 years. Applications accepted from OND & HND graduates of various polytechnics.